While we still await the final results from the IEC, We are now able to bring some statistics which are representative of the final outcome. Unprecedented turnout of almost 57% for the municipal elections; the highest ever for an election of this nature in South Africa - can be attributed to an exciting election campaign and the tight contests that were expected in key areas, analysts and politicians say. "At 2pm on Thursday, 51 642 of 58 158 result slips had been captured by the Independent Electoral Commission (IEC). That constituted 71,1% of the results that by then had been released. "Preliminary voter turnout based on results released thus far [2pm Thursday] stands at 56,4% and spoilt ballots at 1,96%," said IEC chief executive Pansy Tlakula. At 4pm on Thursday, when 71% of the votes had been counted, the highest turnout was in the Western Cape, where 64,9% of registered voters came out to vote, while only 44,31% of registered voters in Limpopo went to the ballot box. Overall, the ANC had secured 62,5% of the votes, the Democratic Alliance 23,3% and Congress of the People 2,4%. The Inkatha Freedom Party The Inkatha Freedom Party received 3.6% and its breakaway party, the National Freedom Party, secured 2,4% of the votes." "In the previous local government elections held in 2006, the ANC won 66,3% of the vote, the DA 14,8%, the IFP 8,1% and the then almost defunct Independent Democrats 2%. According to Wits University political analyst Susan Booysen, controversies such as the "toilet wars" and "politicians on all sides embarrassing themselves" made this election the most exciting municipal election South Africa has ever seen." "It was a high-profile campaign about different issues and people are unhappy. If you think your vote will make a difference, you'll vote," Booysen said. ANC secretary general Gwede Mantashe told the Mail & Guardian that South Africans tend to become more politically active when the going gets tough, in spite of political theory that prescribes that voters tend to stay away in such circumstances. The DA won traditionally black wards in Mpumalanga (2), North West (1) and Limpopo (1)". "It does show the DA is cracking the glass ceiling of race," said Justin Sylvester, a researcher at Idasa." For Booysen, the DA "had not managed to penetrate the ANC fortress" but the party would build on small gains to extend its black support. "It will parade these results like it parades Midvaal and use it to further bite into ANC support. But all in all, it is a small result for a very big campaign," she said. The DA secured most of the municipalities in the Western Cape, taking Saldahna, Hessequa, Knysna and Langeberg from the ANC and retaining Baviaanskloof in the Eastern Cape. largely due to the 'coloured vote' outside Cape Town. 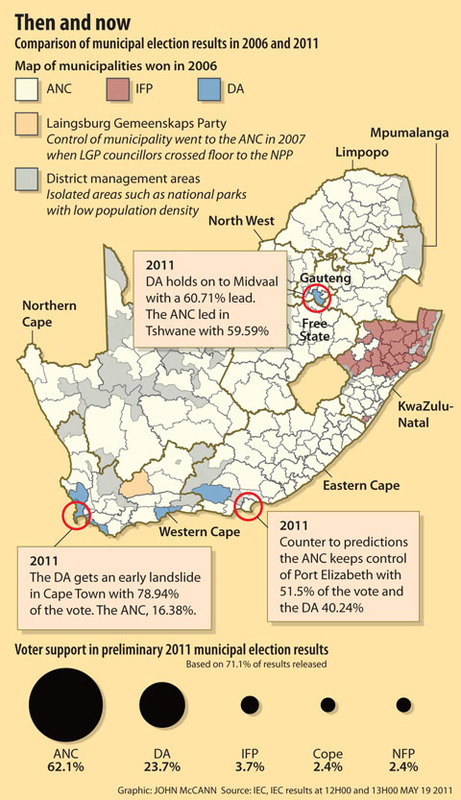 Without doubt, the incredible success of the DA in this region can only be attributed to this voting block. The 'coloured' sector of the population has been repeatedly let down by the ANC. We only have to remeber the commercial fishing licence fiasco dating back to as long ago as 1998 (where these largely fishing based communities were 'given' virtually all the available 'class A' licences, in a blatant move to secure their vote in the 1999 National Election. However, a majority of these voters had to sign their licence over to organised commerce, in order to raise the exorbitant application fee. 20 May, the DA announced they had lodged a complaint with the IEC, requesting a re-count in this metro. The DA lost this metro by 28 votes only All metros except for Cape Town remain in ANC hands, while Cape Town was expected to secure an outright majority of 52%. In a close run and hotly contested election campaign, the ANC secured a marginal victory over the DA with just over 51% of the ballot. This ("Home of the ANC" and one of the "initiating centres " for the "liberation strugle" from 1975 onwards) metro has now clearly indicated they are not satisfied with the ANC performance since coming to power in 1994. "Of the Western Cape municipalities, the ANC had at the time of going to print secured only Oudtshoorn and Beaufort West, where controversial former mayor Truman Prince is on the ANC's proportional representation list. Bitou (Plettenberg Bay) was tied between the ANC and the DA." "Nationally, only 2,4% of the lost ANC supportwent to the DA while Cope remained the largest reason for the ANC decline in some areas, Booysen said. Although Cope had secured only 2,4% of the vote by Thursday afternoon, it will be the kingmaker in at least one municipality in the Northern Cape: Hantam was declared a tie between the DA and the ANC." "We won all the metros except Cape Town, even the new ones," Mantashe confidently declared on Thursday. Early on Thursday morning, the voter turnout in Mpumalanga stood at 9%, causing mild panic among ANC leaders, but it picked up during the course of the day and was about 50% at the time of going to press. The ANC also retained control of Moutse, the Limpopo town in which residents are demanding to be integrated with Mpumalanga. The ANC secured a landslide victory in Limpopo with 82,77% of the vote. The DA won 6,64%, Cope 3,73% and independent candidates 1,03%. In the Free State the DA had a better showing with 22,6% but the ANC took more than two-thirds of the vote at 69,47%. In KwaZulu-Natal, the ANC had secured 55,09% of the votes while the IFP managed 19,55% and the National Freedom Party 12,64%. As the results rolled in on Thursday, the beleaguered IFP's control of 32 of KwaZulu-Natal's 61 municipalities was under serious threat. Of the 16 municipalities that the IEC could confirm results for on Thursday afternoon, the IFP had lost its majority in six to the ANC. To the north of the province, early results suggested that the NFP, which broke away from the IFP, had split the latter's traditional support base. In Zululand towns such as Vryheid and Phongola, results were running neck and neck between at least two of the three main political protagonists in rural areas of the province. The scene will be set for coalition in several of these rural municipalities. We all eagerly await the final results due to be released by the IEC on Saturday, 21 May. Hopefully, we will be able shortly to access the full statistices for this election, and can bring these to you.